You Save: $28.96 (88%) Ships in 1 day. Hard Cover, 160 pages, 8.00 x 9.50. 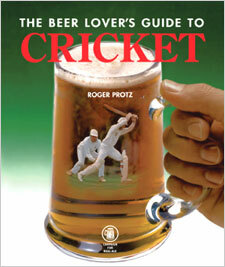 There are many books about cricket and many on beer, but this is the first book to bring the two subjects together. Leading beer writer and cricket enthusiast Roger Protz has visited the major grounds of all the First Class counties to prepare in-depth profiles of them—their history, museums, memorabilia, and notable records. Many of the museums, including Lord's, Trent Bridge, Taunton, and Old Trafford help trace the history of the game with fascinating collections of ancient bats, balls, blazers, books, caps and trophies. The pleasure of each visit is rounded off with a detailed description of the best pubs in the vicinities of the grounds and the real ales they sell. The book also traces the fascinating story of the birth of the modern game at the Broadhalfpenny ground in Hampshire opposite a pub, the Bat & Ball, and shows how the tradition of good beer and cricket is kept alive at many grounds. The Beer Lover's Guide to Cricket also details some of the great cricket victories, including Jim Laker's 19 wickets in a Test; Botham's remarkable feat at Headingley in snatching victory from the jaws of defeat against the Australians; and the pulsating 2005 Ashes series. Roger Protz is a journalist, broadcaster, and campaigner and the author of more than 15 books about beer and brewing. He is the editor of the annual Good Beer Guide now in its 32nd year. His awards include Glenfiddich Drink Writer of the Year 2004 and Lifetime Achievement Award British Guild of Beer Writers.